Osaka Castle is the symbol of Osaka. 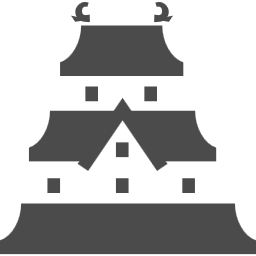 Osaka Castle (Osaka-jo) was built by the hegemon Toyotomi Hideyoshi, who ruled Japan in the latter half of the 16th century. The construction work began in 1583 and most buildings such as the castle tower were completed in 1585. Its gross area is over 3,300,000 sq m and tens of thousands of people were daily mobilized in its construction. The donjon is five-tiered and nine-storied, and has large golden sea creature ornaments shining on the rooftop. It is claimed that pure gold chasings were set in the corridors. One of the charms of this castle is the beauty of its stone wall. Reportedly, there are 40,000 rocks in the wall. Legend has it that powerful daimyo( feudal lords) from all parts of Japan competed in carrying the large rocks to display their loyalty to the Toyotomi hegemon. The existing castle tower was built in 1931. It has five tiers and is approximately 40 m high. The Osaka castle tower is surrounded by secondary citadels, gates, turrets, impressive stone walls and moats. The Nishinomaru Garden is a lawn garden with 600 cherry trees and nice views of the castle tower from below. Visitors can enjoy plum blossom viewing before cherry trees. The entire Osaka Castle Park covers about two square kilometers with lots of green space, sport facilities, a multi-purpose arena (Osakajo Hall) and a shrine dedicated to Toyotomi Hideyoshi. The park is one of Osaka’s most popular hanami spot during the cherry blossom season, which usually takes place in early April. Enjoy approx. 300 cherry trees in Nishinomaru garden at night with the illuminated Osaka Castle donjon. 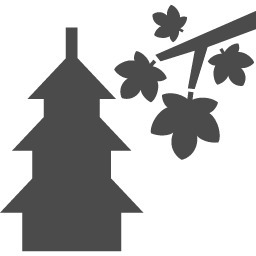 The scenery of the castle tower risen up over the cherry trees is truly beautiful. 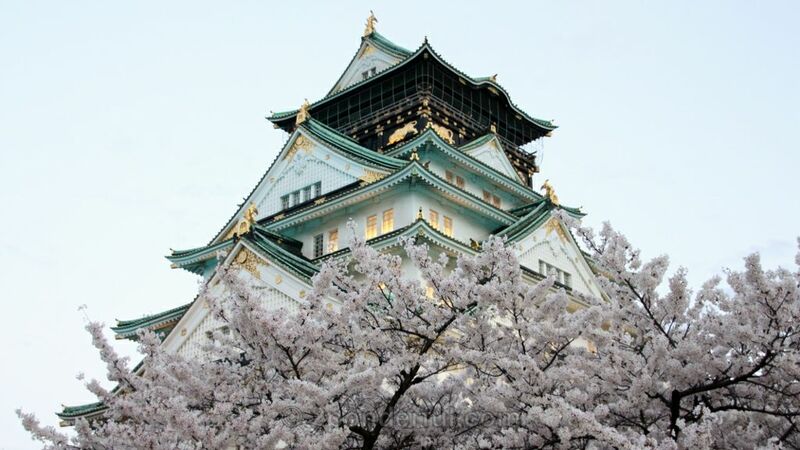 Osaka castle offers beautiful autumn colors, reddened cherry leaves, yellow gingko trees and red maple leaves. This Boat was reproduced by referring to Hideyoshi’s Ho-Oh-Maru boat, which was painted on Toyotomi-Ki Osaka-Zu Byobu (The Folding Screen depicting Osaka in the Toyotomi Era). As seen at the Rikyu and Hideyoshi’s golden tea-ceremony room, Hideyoshi loved gold deeply. Osaka Castle used to be also called the Golden Castle for shining gold when the sunset reflected on the castle. The boat goes around the inner moat of Osaka Castle in approximately 20 minutes. It is a great opportunity to enjoy the sight of the castle tower from the inner moat.